Yellow Dock - Pure Herbs Yellow Dock is beneficial as a tonic to support the lymphatic system and good skin health. * Rumex crispus; L.
Alma Hutchens cites Yellow Dock as, "A favorite herb of ancient Indians, old time doctors, early settlers and herbal practitioners.' Perhaps its prime function is due to its extremely rich organic iron content. Because of this, oxygen for the breath of life is combined easily with food materials for energy and to oxidize food materials and reduce them to easily eliminated ash from the depths of the cellular mitochondria (body's furnace). Yellow Dock is often recommended for prenatal cases so mother and baby can have proper oxygenation for a normal pregnancy. The rich supply of iron provides baby with enough iron to survive on a diet of breast milk for 6 months after birth without additional iron, as is expected. The solids of Yellow Dock when analyzed are up to 40% iron. This type of iron cannot be picked up by a magnet. Iron formulas often employed in the prenatal diet by "modern" doctors are straight from iron ore and can cause liver poison and black stools. 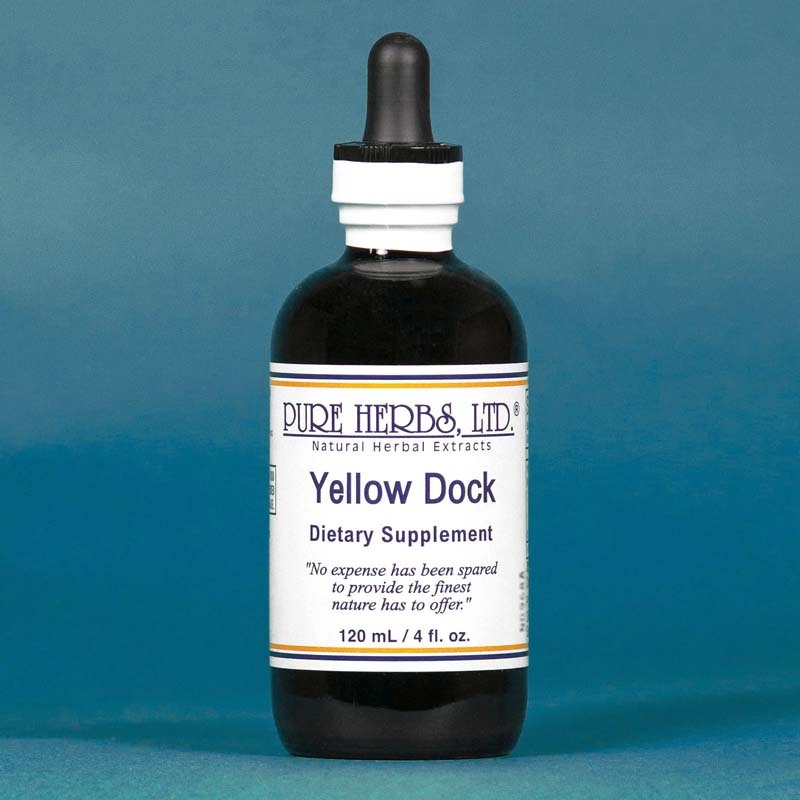 Yellow Dock's iron is closely associated with the living plant processes and is easily absorbed. Modern science today will do well to recognize the relative activity rates of different types of iron rather than make false assumptions that iron filings are as good for you as Yellow Dock iron. Healthy mothers and babies speak much for the difference. Herbalists have traditionally used this mineral-rich plant for sore joints, blood from the lungs, tumors, leprosy, cancer, chronic bronchitis, diseased spleen, swollen lymph glands and as a valuable source of iron for male and female system. Rub the extract on spongy gums each evening until relief. Loose teeth are thus replaced in proper position. Use the extract for shingles by combining Yellow Dock with Burdock to make an application. Apply Vitamin E to the affected area. Then place a cotton cloth, with no dye, soaked in the extracts over the area followed by a plastic wrap and a cloth wrap to hold it all in place. (Ratio for this solution is 10 to 2.) Ten parts of water to one part of each two Docks. This may also be used on other types of skin eruptions and skin allergies. DOSAGE: Internally 10 to 40 drops one to two times per day. During pregnancy, 10 to 40 drops three times per day. SOURCES: Alma R. Hutchens, "Indian Herbalogy of North America;" Dr. John R. Christopher, 'School of Natural Healing;" Drs. George Wood & Franklin Bache, "The Dispensatory of the United States," 12th Edition.